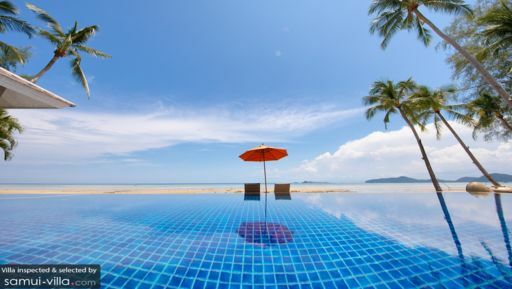 Slow down and unwind with a vacation to south Samui. Here you’ll find quiet beaches stretching out along the coast, inviting villa travellers to take long beach strolls and enjoy seafood feasts in the evenings. Home to an array of low-key hangouts, the region offers a refreshing change from the boisterous atmosphere of Lamai or Chaweng. The south’s sleepy, relaxed vibes easily permeate your villa, creating a tranquil ambience that encourages rest and relaxation. Go for seafront villas that offer direct beach access, so you get to make the best out of the region’s idyllic coasts during your holiday. 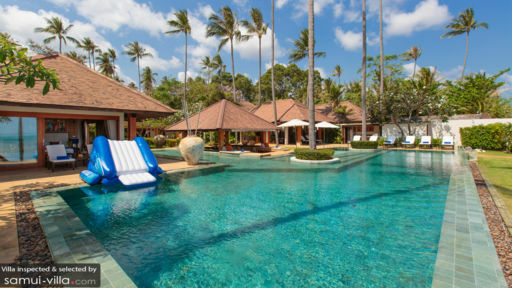 Each villa is thoughtfully furnished, featuring impeccable interiors, capacious living spaces and well-landscaped grounds with Buddha statues, lush foliage and water features. The serene coasts of the south are made for leisurely beach strolls. But if you’re looking to get more action packed into your day, try kiteboarding at Nathon between May to October, or at Hua Thanon during October to April. Stand up paddleboarding is also a popular activity, and is available at Lipa Noi, Mae Nam, Chaweng and Lamai. With a wide-ranging array of dining options, there’s something for every traveller in south Samui. No island vacation is complete without a mouthwatering seafood feast, and your best bet is at Thong Krut Fisherman’s Village, where seafront venues offer unbelievable views and fresh catches. Fine dining is best enjoyed at Taling Ngam, home to beautifully appointed restaurants like Jahn, The Island View and La Cuisine. There’s great coffee at 4 Monkeys Coffee Bar, and wholesome organic fare at Sweet Sisters Cafe. For sundowners accompanied by magical sunset views, try Nikki Beach Club, The Beach Club at Shiva Samui or Bamboo Beach Bar Cafe and Restaurant. There’s also the option of dining in, and your villa manager will handle all the details - from grocery shopping to engaging a private chef. Water sports enthusiasts looking to try something new will enjoy snookah diving - an activity that’s a cross between scuba diving and snorkeling. Or hop on two wheels for a half-day or full-day bicycle tour to take in the picturesque sights of the island and discover its hidden gems. Families will enjoy day trips out to the neighbouring islands of Koh Mudsum and Koh Tan, where excellent snorkeling and relaxed beach strolls await.